Editor's note: Yahoo! Sports columnist Pat Forde was given exclusive access into the unique daily student life of Notre Dame's football players. NOTRE DAME, Ind. – Alvin Hu's bare feet pace back and forth in the dorm hall, the facts and figures tumbling in torrents from his mouth. "Beat Navy in Ireland, 50-10! Next we beat Purdue, 20-17! Michigan State, 20-3! Michigan, 13-6! Miami, 41-3! Stanford, 20-13 – in overtime! BYU, 17-14! We beat Oklahoma, 30-13! Then Pittsburgh, 29-26 – in three overtimes! Boston College, 21-6! Wake Forest, 38-0! And USC, 22-13!" As his friends laugh at this display of rapid-fire recall, Alvin finally exhales. Then he triumphantly declares, "It's over for Alabama!" Alvin is a Notre Dame senior majoring in Computer Science and Engineering. He also has a developmental condition that makes social interaction difficult. In addition, he is liable to fixate on certain interests – and right now his primary interest is Fighting Irish football. "At Mass people will be offering prayers for their grandmothers and family," says Sorin College residence hall adviser Colin King. "He'll pray for the football team to win. He has a sincerity you can't match." Despite the social issues Alvin faces, he is embraced by the other students who live in quaint, historic Sorin, the oldest dorm on campus. That includes Alvin's heroes, the Fighting Irish themselves. There is no separate society for football players here. The biggest stars on campus – the guys who will play Alabama in what presents itself as an epic BCS championship game matchup – also live as close to a normal life as any major program in America. There is no football dorm, a common vehicle for athletic segregation at many schools. There are no bunny majors where the jocks flock to escape Notre Dame's renowned academic rigor. There is an expectation of socialization with the regular Joes. For those reasons, plus the natural intimacy of an 8,452-person student body, Alvin's heroes are also his peers. "He's one of us," says defensive lineman Grant Patton, who, along with defensive back KeiVarae Russell, was there to hear Alvin recite the results of their dream season. 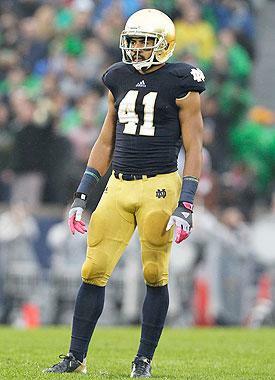 Grant is a senior walk-on from Louisville, Ky. KeiVarae is a freshman starter from Seattle. They're two of several players living in Sorin, intermingled with the general student population. KeiVarae's roommates are from Brazil, Michigan and North Carolina. None plays football. "I've really enjoyed that," KeiVarae said. "A lot of schools I visited, the players were isolated from the rest of the students. This makes you fit in. "Football players, I know how we got here. I didn't know how my roommate got here from Brazil, or how guys got here from Michigan or North Carolina. I've learned a lot." Last Thursday, KeiVarae walked a visitor through Sorin introducing him to a wide cross-section of students: the studious kid who is always in the dorm's basement kitchen on his laptop; the preppy kid who dresses like a male model; the kid who plays saxophone in the marching band; the kid from Mississippi on his way out to buy a gift for the dorm's Secret Santa freshman present exchange. Real life and real people. With members of the No. 1 football team in America mixed in. "When you live here," Grant said, "people can see you for more than just the shiny helmet and blue jersey." Notre Dame is not without flaws. There have been plenty of compromises in the school's overarching philosophy to facilitate King Football, from the firing of Tyrone Willingham after just three years to the introduction of a training table for athletic dinners to the reduction in student penalties for transgressions like drunk driving. There are some who hold the football program accountable for two deaths in 2010: a video manager whose crane toppled during a high-wind accident at practice; and a female student at neighboring Saint Mary's College who committed suicide not long after alleging she was sexually assaulted by an unidentified player. The player, who was not charged with a crime, is on the current undefeated team. But in many ways Notre Dame remains a major-college athletic anomaly. The world's most famous Catholic university aspires to win like a football factory while educating like an elite institution, and it largely succeeds. The school ranks No. 1 in the NCAA's most recent Graduation Success Rate. It is the smallest (in enrollment) and most academically prestigious (in national rankings) school to play for a championship in the BCS era (1998-present). It also is the only religiously affiliated school in that time to compete in the title game. After decades of declining football returns, this season is the return to glory. And it's been accomplished with players who are still part of the fabric of everyday campus life. Players who don't just touch that "Play Like A Champion" sign in the Fighting Irish locker room. They touch the foot in the Sorin College entryway as well. The first thing you see upon entering Sorin is a statue of Notre Dame's founder and the dorm's namesake, Father Edward Sorin. If you look closely, you see that Sorin's right shoe, which sticks out from under the priest's robe, is much shinier than the rest of the statue. That's because the residents of Sorin College touch the shoe every time they enter or exit the dorm. 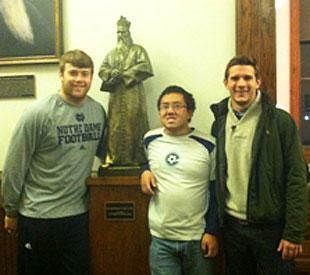 It's tradition, and few places love their traditions more than Notre Dame. The statue's stand is bolted into the floor these days to keep Father Sorin in his place. In years past, the statue had been "borrowed" and relocated to exotic locales – there are pictures of the bearded, bronze founder at the Great Wall of China, the Eiffel Tower and many other landmarks. The statue is not the dorm's only famous non-human resident. There are frequent bat sightings on the third floor, which inevitably mobilize a hallway posse armed with hockey sticks, baskets, boxes and pillow cases. On the first floor you find two residents you won't see in the dorms at Alabama or just about anywhere else: Father Bob Loughery, the rector who conducts masses and oversees the dorm; and Father Edward "Monk" Malloy, president of Notre Dame from 1987-2005. Loughery is known for his Wednesday chili Mass, where he treats students to a five-gallon pot of chili after service. Malloy is known as a university (and Sorin) institution. Malloy has spent 33 years living in Sorin, including all 17 that he served as school president. 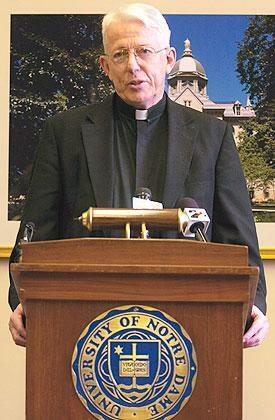 He now teaches a freshman seminar every semester and conducts Mass in the dorm chapel on Tuesdays and Thursdays. His office door in the dorm is usually open for students to come in and talk. "I've been in to see him several times," Grant said. "He's got these soul-piercing eyes." Malloy also had a net-piercing jump shot back in the day, as an undergrad member of the Irish varsity and later regularly playing pickup basketball with students and staff while president. The successor to Rev. Theodore Hesburgh, the man who propelled Notre Dame to elite academic status, can appreciate the dual pursuit of athletic and academic excellence, with a dash of religion on the side. A crucifix hangs above the door in room 118 of O'Shaughnessy Hall. At the front of the classroom, Edoth Mukasa is about to start his Foundations of Theology class. But first, while loosening his Roman collar, the priest smiles and wags his finger at Notre Dame linebacker Romeo Okwara. "Romeo," he says, in an African accent. "Alabamaaaa. I would have liked Georgia, but you wanted it." Mukasa likes to small talk with all 27 students in his class, but he especially enjoys a little football banter with the only player in the room, Romeo. The true freshman is only 17 years old, but at 6 feet 4 and 250 pounds he barely fits into his desk. When Mukasa brings up the BCS championship game matchup with the Crimson Tide, Romeo smiles. "It seems like everyone else wanted Georgia," he explained later. "I preferred Alabama. Everyone says they're the best, and you want to play the best." After the football chat, Mukasa leads his class in the Our Father. Then he gets down to prepping them for their final – going literally old school, with chalk on blackboard. Romeo pulls out his Oxford Annotated Bible and begins taking notes. At Notre Dame, all students must take at least two Theology classes – another aspect of daily life you don't find at Alabama or any other power program. Romeo, who lived in Nigeria until he was 12 and is Catholic, says he enjoys Mukasa's class – even though it's his third class of the day every Tuesday and Thursday. As a freshman, Romeo has a mandatory two-hour study hall Sunday through Wednesday. There are tutors and academic advisers assigned to the players to help them as needed. If they attain a certain grade-point average their first year, they don't have to attend study hall. "In high school I felt like I could breeze through," says Romeo, who is from Charlotte and hopes to major in accounting or finance. "Here, you have to do a lot of studying on your own, outside of class." When Mukasa's finals review is over, Romeo heads out of the building. Outlined against a blue-gray December sky, he rides again. On his Shimano bicycle. Across campus to his dorm, Dillon Hall. Bikes or walking are the only ways to get around for Notre Dame freshmen – no cars are allowed on campus. Fortunately for them, it is a compact campus. Romeo's trip to Dillon only takes a few minutes in the crisp winter air. It's a festive atmosphere inside – Christmas lights are strung along the ceiling and walls on every floor. A Christmas tree is in the hallway a few doors down from Romeo's room. Wrapping paper is on the walls. Room 374 is about what you'd expect for a couple of freshmen: a wreck. Shoes and clothes cover most of the walking space – and there's not much of that anyway; the rooms in Dillon are smaller than in Sorin. There is a TV, a couple of chairs and desks, a poster of the Notre Dame women's soccer team on one wall and that's about it. Oh, and a lei on the corner of Romeo's bed. That was a gift from Hawaiian-born Heisman Trophy runner-up Manti Te'o. Seated at one of the desks is Romeo's roommate, Luke McCormick, a freshman pre-med/biology major from Chicago. Next to the TV are two plastic containers of cookies that just arrived from Luke's mom. "They're the best," Romeo says. "They'll be gone tomorrow." Luke says his mom sent extra cookies because she knows Romeo likes them. "They love him," Luke says. "I'm the celebrity in the family, rooming with a football player." It was around the Fourth of July that Luke found out who his roommate was. When he got the name, he searched for it on the Internet and saw Romeo's recruiting profile. It was pretty cool having a roommate with readily accessible video highlights online, but sharing living space helped demystify Romeo. "If you live with them," says Luke, "you view them differently than if they were 'those idols' walking around campus." The first indication that Matthias Farley is not your average college kid is when he bypasses the free Dunkin Donuts his English teacher brought for the last day of class. The class is entitled "Satire," and on this day students are finishing presentations on examples of satire they have found in modern American pop culture. Matthias gave his presentation a few classes back. Today he's just here to watch and enjoy the others, occasionally raising his hand to offer a response to a presenter's question. Later in the day he will finish a paper for the class comparing the satire novels "Candide" and "Gulliver's Travels." The redshirt freshman starting safety's Twitter bio reads, "I am half black half white, I am a very skilled kazoo player, and I AM IRISH." That only begins to tell the story. Matthias grew up playing soccer, not taking up varsity football until his junior year at Charlotte Christian Prep School. Yet he's no fragile footie flake – he had surgery to insert two plates and four pins into a badly broken right thumb after the triumph at Oklahoma Oct. 27, and never missed a game. His father was a fencer. He has six siblings, including a brother who left home to join the New York City ballet at age 13. Another brother played professional basketball in Europe. Before he got serious about football, his preferred method of transportation was a longboard (think an XXL skateboard). Matthias' prize possession is the beard that juts off his caramel, freckled face. Safety Zeke Motta, guard Mike Golic Jr., linebacker Carlo Calabrese, defensive end Kapron Lewis-Moore and Matthias have dubbed themselves the "Beard Gang." In other words, Matthias points out, they are "pogonophiles" – one who loves or studies beards. He is majoring in film, television and theater. Not surprisingly for a guy with a lot of personality, he's interested in a sports broadcasting career. The college choice came down to Notre Dame, North Carolina, Duke and North Carolina State. And the final decision was not a difficult one. "Then I came up for a visit in spring of my junior year, and I literally put my foot on campus and said, ‘I love it here.' I figured I can only play football for so long, so it was almost a no-brainer. Get one of the best educations in the world and then you're set, no matter what." Matthias roomed with non-athletes from China, Miami and Connecticut last year. 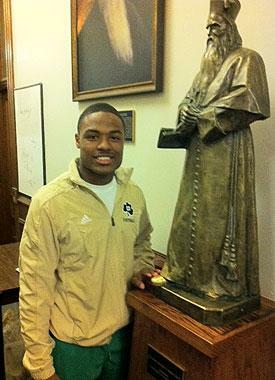 He arrived thinking he'd enroll in Notre Dame's No. 1-ranked Mendoza School of Business, "Then I realized how much math it was going to take." Even with math out of the way, Matthias' days are full. He's taking 15 credit hours this semester, which means many of his weekdays go like this: weightlifting from 8-9 a.m., class from 9:30 a.m. to 1 p.m., meetings at 2:15 p.m. and then practice. After dinner at the training table, it's time to study for a few hours. "If you manage your time, you have enough hours in the day," he says. "I learned last year that I can do it – I can manage the academic load, the social aspect and football, and still be fine and sane." This year he lives in Dillon hall with two teammates, but that's not who he spends all his time with. The night before his last Satire class, Matthias was playing soccer video games with a bunch of non-football friends. "I feel like living in a football dorm would really limit you socially," he says. With that, Matthias Farley heads out for a bite to eat. After passing on a free doughnut during class, he has his eye on sushi for lunch. In Sorin College residence hall, Alvin Hu is still walking the halls barefoot, and still fired up. "Notre Dame football is going to the national championship game!" he yells. So, too, is Alvin. Colin King, the Sorin R.A., is going to take him. The two road-tripped to East Lansing for the Michigan State game in September. This will be a more ambitious endeavor, but it will also be the highlight of their senior years at Notre Dame. "We're all going to Florida!" Alvin shouts. "January 7th at 8:26 p.m.!" What has been the best part of the season? And how do you like living with the football players in Sorin College? "Everyone," Alvin Hu says, "is a nice guy."